Take exit 145 and follows signs for 280 West. Take exit 10 toward W. Orange/S. Orange/Montclair. Turn left onto Northfield Ave. Travel about 4 ½ miles. Turn right onto South Livingston Ave. We are on the left. If you see the ShopRite® on the right you’ve gone too far. Take exit 15W and follow signs for 280 West. Stay in the left lanes past signs for Newark and the Garden State Parkway. Take exit 10 toward W. Orange/S. Orange/Montclair. Turn left onto Northfield Ave. Travel about 4 ½ miles. 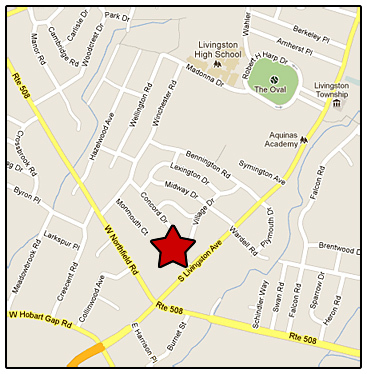 Turn right onto South Livingston Ave. We are on the left. If you see the ShopRite® on the right you’ve gone too far.